To be honest, I can't really argue with Edy's self diagnosis, this ice cream really does taste just like an ice cream sandwich. Who doesn't remember ice cream sandwiches being a staple of your childhood diet, long before we had frozen snickers and a never ending supply of Dove Bars and Häagen-Dazs. Oh, so many times I remember having just a few coins in my pocket and being hungry, but knowing I could always afford an ice cream sandwich. If you've never had it, give it a try and take a stroll down memory lane. 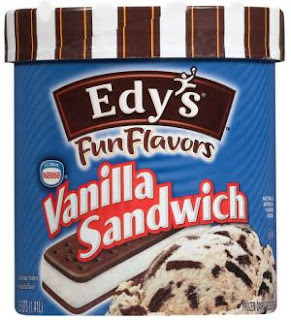 Great idea Edy's! Sept 2008 Update: This is now known as the Nestle Vanilla Sandwich Fun Flavor. That mean's it's gone from grand ice cream to a frozen dairy dessert. Nutrition now clocks in at 130/35/0/2. I like the line "This is a New and Exciting Fun Flavor". Sure, take out the ice cream, slap on a new label, and you have a fun new product ....funny how that works. Can you tell I'm a little miffed they messed with one of my favorite Edy's flavors?